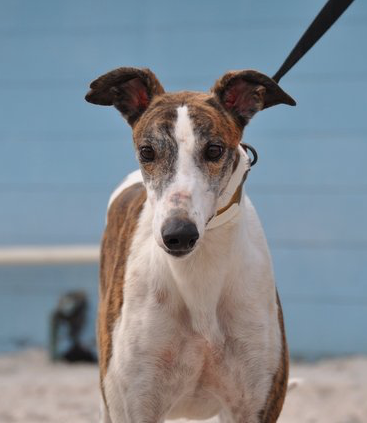 Rosa came in initially from the Orange Park Race Track in Jacksonville FL. She wasn't even two yet when she first arrived. She just wasn't very interested in racing so never actually became a racer. Her sire is the famous DJays Octane and her dam is Alissa's Posa. Rosa was was quickly adopted by her foster family and has been in a home for a year and a half. She was just returned to us due to some very serious health issues that made it impossilble for her family to care for her. Rosa turned 3 on January 26th. She is good with kids and small dogs. She passed her initial cat test with only a little interest but wanted to chase cats in her foster home after she got more comfortable there so she needs a home with no cats.